In keeping with a current Portland trend, a couple of underutilized lots have been transformed into great little food cart pods in Eliot. The first few carts to call Eliot home are located in a lot named Jimmy’s Corner at the corner of Vancouver and Fremont Street. I discovered them several months ago while out canvassing the area to notify residents about upcoming neighborhood events. The owner of Mum’s Kitchen offered samples of her African fare and I was hooked. Soon after, a Mexican cart arrived and their homemade fresh tamales made my mouth water. The pod also has a pita cart and a drive thru coffee cart. In June, the old American State Bank at NE MLK Jr Blvd and NE Graham Street, which had sat vacant for several years, was put to good use. During the summer Dreamer’s Marketplace was born as several food carts arrived. Now, a great meal is only a few steps away. Each cart has its own unique flare and all serve fantastic food. There are 7 carts featuring Mexican, Roast Beef Sandwiches, Norwegian, Central American & Caribbean, West African & Caribbean Fusion, Homemade Tortilla Wraps & Breakfast Quesadillas, and Peanut Butter Inspired Food. The carts are open most days except Monday, some from breakfast until dinner, and others just for lunch. One of the great things about the carts, besides that a group of people can all satisfy their unique palette in one location, is many of the chefs enjoy trying out new and creative recipes to test on their customers. I often reap the reward of sampling these new recipes. Recently I have tried homemade potato chips with unusual flavors like Lavender and Summer Lawn, new varieties of salsa, fresh lingonberry soda, and yucca fries with chipotle dipping sauce. 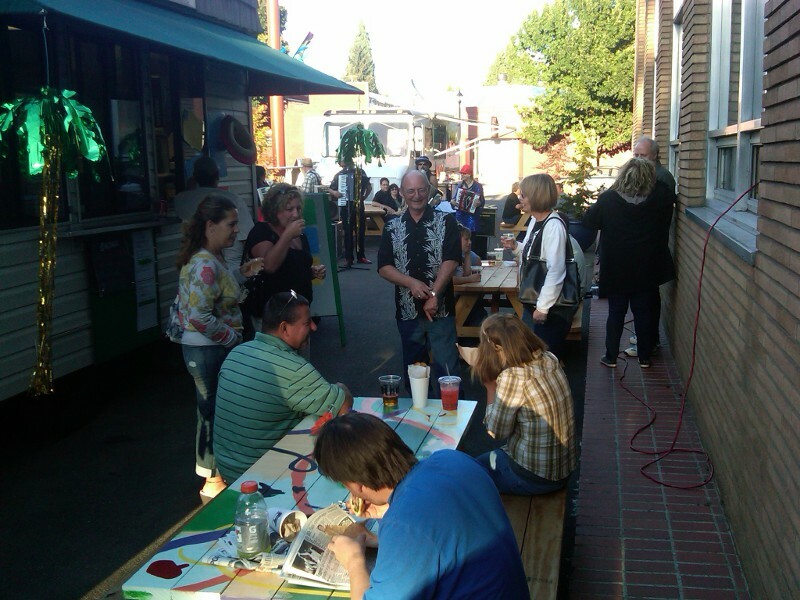 On Friday evenings Dreamer’s hosts happy hour with food discounts and a beer and wine garden often with live music. Having a drink while listening to music and snacking on yucca or fresh nuts from Jimmy, the traveling nut guy, has been a perfect way to start the weekend. The pod is becoming more inviting to patrons with the addition of picnic tables, potted flowers and trees, outdoor lighting, and soon a more permanent covered seating area. With Portland’s love of food carts, hopefully these small businesses are here to stay. Jimmy’s Corner is located at 3441 North Vancouver Ave and Dreamer’s Marketplace is located at 2737 NE MLK Jr Blvd.